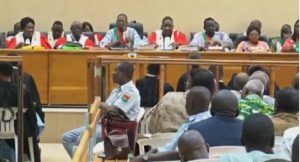 The trial of Burkina Faso’s former leader Blaise Compaore and his cabinet began on Monday after two delays, with the court dismissing calls from the defence to cancel proceedings. Compaore, who fled during a popular revolt in 2014 as he sought to extend his 27-year-rule of the West African country, is being tried in absentia. He currently resides in exile in neighbouring Ivory Coast where he has since acquired citizenship and which refuses to extradite him. They appeared relaxed in the full courtroom of the justice palace on Monday, smiling and shaking hands with old acquaintances during break. Among the crowd were both senior officials of Compaore’s former ruling party which remains a powerful political force in the country and former protesters, a Reuters witness said. Defence lawyers on Monday sought to dismiss proceedings, arguing that it was unconstitutional since there are no means for the accused to appeal the verdict. Defence lawyer, Antoinette Ouedraogo said, “We have simply asked them to present our demands to the judges that deal with the constitution so that they (the demands) be put to issues of constitutionality. “If it is said that these law are constitutional then we will come back. But if it is said that it is not constitutional, what do we do? there is no trial. “But for us, lawyers who have sworn an oath to apply the law whatever the circumstances and in everything, do you think we can stand there before a jurisdiction that walks all over the constitution? the constitution! We cannot. That is the reason we have politely told them that we were leaving. After a three hour pause, the president dismissed their request, prompting the defence lawyers to walk out. Since the 2014 uprising, the former French colony has completed a rocky transition period during which a former ally of Compaore attempted to seize power in an averted coup followed by general elections. Some Burkinabes say they are disappointed that the post-Compaore government led by Roch Marc Kabore has not yet delivered on all of its reform pledges. Still, they welcomed the opening of the trial — the first in a series of cases being investigated by the new government to be brought to trial.